I’ve had VFTs in the GH for several years, it doesn’t get below 55F and usually 60+F is more common in the winter. I moved one VFT into the house, bay window, just as an experiment last fall. As the days shortened, the plant shrank in size and entered dormancy. I don’t know the temp of the window deep in winter, but this morning it was 25F and the windowsill was 60F. It’s been out of dormancy for several weeks and now making a flower. It’s clearly ahead of the plants in the GH, which is kind of weird since they get more sun. Pic is from today. I've actually been wondering about this topic, recently, myself. I have some Dionaea that have skipped one or two deeply cold dormancy periods, so far. They're all indoors, and the light has been 18/6 throughout, but the temperature drops 10-20F in the coldest days of winter (compared to the hottest days of summer), and the humidity drops significantly, as well. That said, I don't believe the temperature ever drops below 50F (58F was the lowest surface temperature that I recorded with my IR thermometer), and the light has exactly as intense every day. I don't remember what happened last year, but this year, the plants that grow both tall and low leaves based on the season, switched to their winter forms, and are just now switching back into their summer forms. All but one, are thriving. I am going to attempt to feed them, this year. 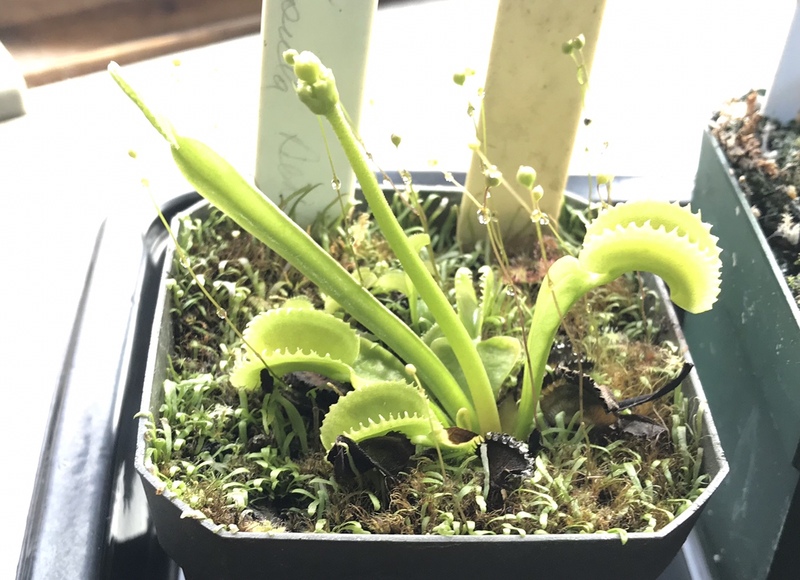 This makes me believe that Dionaea don't require a long, near-freezing dormancy period, to undergo metabolic changes according to the seasons. I am not sure what would happen if they didn't get any form of environmental changes, at all. Almost another year in the books... I still don't see anything that indicates that the plants won't continue to thrive, though they haven't flowered (neither has my big Ceph, which is definitely old enough), so this year I changed things up a little bit. I opened a window, which dropped the temp into the low 50's and maybe even a tiny bit below in the middle of the coldest few nights, and kept the temps in between 66-73 during the day,. I also dropped the photoperiod to 14/10 from 20/4, and will be returning it to the summer schedule on April 1st. The window was closed this week, since bugs are starting to show up outdoors again, and I don't want pests coming into my plant room. Still, no deep dormancy, but more of a change than the previous years. I just want the flowers for breeding projects, otherwise I wouldn't mind. Doesn't matter that it's 80° out, as long as the light levels decrease enough, they will take the cues and go dormant they'll wake up and flower a few months later.